Healthcare has been a hot industry for a while, and it promises to continue to be one for at least the next several years. The Bureau of Labor Statistics (BLS) predicts healthcare will add more jobs than any other occupational group—over 2.4 million—between 2016 and 2026 (Bureau of Labor Statistics, U.S. Department of Labor, Healthcare Occupations, Occupational Outlook Handbook). Audiologists treat and diagnose people who have ear problems including hearing and balance difficulties. To work in this field you will have to earn a Doctor of Audiology degree (Au.D.). This endeavor takes most students about four years after they graduate from college. To practice, you will need to have a license. Dentists diagnose and treat patients' problems with their teeth and gums. You will need to attend dental school for four years after you earn your bachelor's degree. A state-issued license is required to practice. Dietitians and nutritionists plan food and nutrition programs and supervise the preparation and serving of meals. To become a dietitian, you will have to earn a bachelor's degree in dietetics, foods and nutrition, and food service systems management. To become a nutritionist, study nutrition in college or graduate school. Most states license dietitians, but many do not license nutritionists. Doctors diagnose and treat injuries and illnesses. 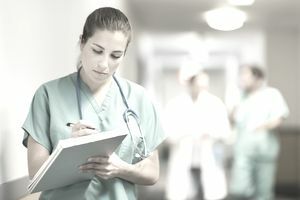 After graduating college, you will have to spend four years in medical school and then between three and eight years in an internship or residency program. After you complete your education, you have to get licensed. Occupational therapists use exercises and techniques to help patients learn to perform daily living or work-related activities. Becoming an occupational therapist will require earning a master's degree and then getting a license. Optometrists provide primary vision care. They examine people's eyes to diagnose vision problems and eye diseases. If you aspire to be an optometrist, you should plan to attend optometry school for four years after you graduate from college. You will also need a license. Pharmacists dispense medications that doctors and other health practitioners prescribe to their patients. They also provide information about those particular drugs and help the patients understand how to use them. To become a pharmacist, you are going to need a Doctor of Pharmacy degree. You can expect to spend between four and six years in pharmacy school depending on whether you have an undergraduate degree when you enter. You will also need a license. Physical therapists help patients who have suffered injuries or illnesses by providing services that restore function, improve mobility, relieve pain, and prevent or limit permanent physical disabilities. You will have to earn a doctorate in physical therapy and then pass national and state licensing exams. Physician assistants provide primary health care services under physicians' supervision. To work in this field, you will have to get a master's degree from an accredited physician assistant training program and then pass a national certifying exam. Registered nurses treat patients and provide advice and emotional support to them and their families. If you want to become a registered nurse you can either earn a bachelor's of science degree in nursing (BSN), an associate degree in nursing (ADN), or a diploma in nursing. You must also pass a national licensing exam and fulfill any other licensing requirements set forth by the state in which you plan to work. Respiratory therapists evaluate patients with breathing or other cardiopulmonary disorders and deliver treatments to them. You can earn an associate or bachelor's degree in respiratory therapy to qualify for a job in this field. In most states you will also have to pass a national exam. Speech pathologists work with people who have speech-related disorders including the inability to produce certain sounds, speech rhythm and fluency problems, and voice disorders. You will be required to earn a master's degree in speech pathology and, in most states, get a license if you want to work in this field. Veterinarians deliver healthcare to pets, livestock, and zoo, sporting, and laboratory animals. You need a Doctor of Veterinary Medicine (DVM or VMD) from a college of veterinary medicine to work in this occupation, an endeavor that will take an additional four years after earning a bachelor's degree. All states require veterinarians to have a license. Dentist Dental school (4 + years after bachelor&apos;s) Req. in all states $158,120 (salaried dentists); those in private practice may earn more.